Free Shipping Included! Concise Compendium of the World's Languages by Routledge at Translate This Website. Hurry! Limited time offer. Offer valid only while supplies last. From Afrikaans to Zulu, almost 100 languages from the comprehensive Compendium of the World's Languages are featured in this new concise version. From Afrikaans to Zulu, almost 100 languages from the comprehensive Compendium of the World's Languages are featured in this new concise version. Many articles have been revised. 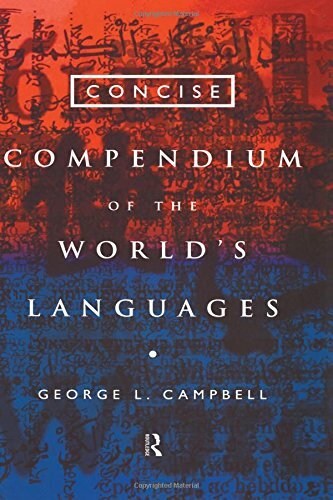 The Concise Compendium presents a detailed comparative study of the major and many of the lesser known languages of the world. Included are representatives of all language families, with samples of Amerindian, such as Navajo and of African languages, such as Fulani and Nama; languages of politically independent groups in the former USSR, like Uzbek and Belorussian; those of political pressure groups, such as Breton and Catalan and significant community/ethnic languages, including Amharic and Vietnamese. A passage from the Gospel of St. John illustrates each language with a written tradition. These scripts are explained in an appendix at the end of the book. Presents 100 of the world's major languages and representatives of different language groups, politically significant languages and particularly interesting ones.